Ever wonder what dailly life was like on the homefront during 1918? If you don’t know much about World War I, this is your chance to experience this fascinating time in American history. Ellie Carlson’s interactive program will engage guests while she shares stories along with music, food, and amazing images connected to the homefront 100 years ago. Ellie becomes Anita Willets Burnham, and comes to Sycamore in a time machine. This Blue Star Mother presents “100 Years Ago on the Homefront” as a living time capsule. 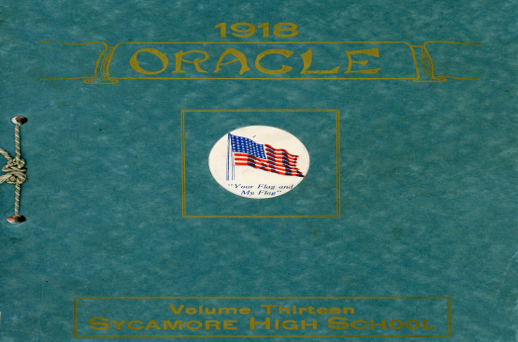 To help you step back into the days of World War I, here is a quote taken from the Oracle, the Sycamore High School yearbook, 1918. “To appreciable extent this is the spirit of the Sycamore High School, which is finding expression in war relief, both Red Cross and Y. M.C.A. Miss Irma Roberts has been conducting a sewing class in the interest of Red Cross work; this group has given time cheerfully to the service. No subject arouses great interest in the classes than that of the comfort and greater safety if the “boys” at the front, and the large number of crosses on the flags in the high school assembly should be daily reminders to us that the sacrifices of the “boys” are in vain if we at home are not trying to make America a better “Home-land” during their absence” ~ Miss Amrine. The event will be held at St. Mary’s Memorial Hall, 322 Waterman Street in Sycamore. Doors open at 6:30 and the presentation starts at 7:00 p.m. The evening also includes a cash bar, silent auction, and dessert. For more information call 815-895-5762. What did dowtown Sycamore look like in 1869? What is the same and what is different?